In our previous post, we looked at 10 signs that indicate you might need a research plan. Plenty of you could identify with the signs on the list. 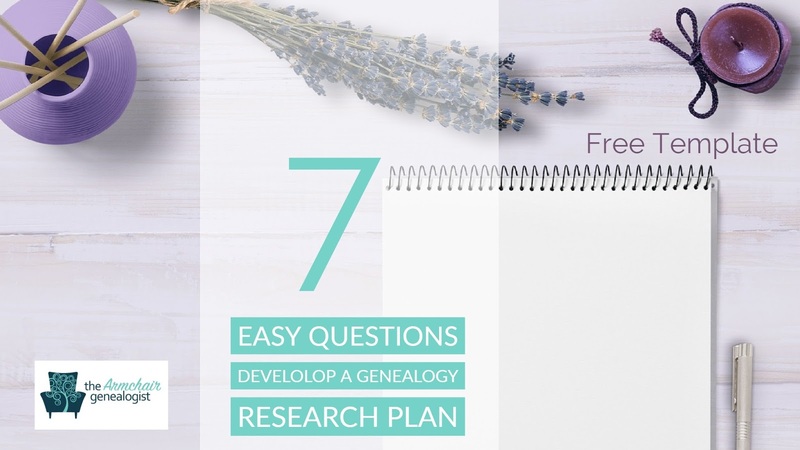 And if you did, then it’s time to start using a research plan to reign in your unfocused approach to genealogy research and stop the aimless wandering. Today we will look at 7 easy questions you can ask. By answering each of these questions, you will be on your way to developing a robust research plan. By the way, we have a template you can download that coordinates with the following questions. Fill in the template as you work through these question. When finished you’ll be armed with a solid research plan and a good chance you’ll have better luck tearing down those brick walls. Question 1 – Who am I researching? Seems pretty basic, but it’s crucial to identify the ancestor you are researching and develop a plan for each ancestor. Too often we research a surname, a couple or a family group, but each ancestor should have their own research plan. You even want to go so far as filling out one of these templates for each question that needs answering. Question 2 – What do I know about this ancestor? This is an important step that often gets overlooked. What do you know about this ancestor? First, by taking the time to identify what you already have in your research, you refresh yourself on what you have. This will eliminate wasting time searching for information already in your possession. Creating a complete outline of what you know will also help you to identify those gaps in your research. Often, we do so much research we don’t even realize we may have the documents and answers in front of us. So, take the time to look at what you know and create a list. Question 3 – What is your research goal? Identify precisely what you want to learn or need to have answered about this ancestor. What questions are outstanding? The unanswered question is the goal of your research plan. That goal may be to identify a marriage date? Perhaps to identify the parents of an ancestor? Or when an ancestor immigrated? Keep your research goal as specific as possible. There is nothing wrong with having more than one research goal for an ancestor but deal with them as separated quests with separate plans so that your research time is focused and you stay on track. Question 4 – What is your working theory? Before you get into researching, write out what you believe to be the probable conclusion to your research goal. What do you think is the answer to this goal? By stating your working theory, it gives you some parameters under which to begin to prove or disapprove your theory. Question 5 – Where can I find my answers? Brainstorm the various resources that might provide the answers and where you might find these resources. Start with your living relatives, do they contain clues or solutions in their boxes of stuff or perhaps their memory. Next go online and if so which databases might have these records. After that, a trip to archives might be necessary. Many archives offer online finding aids and indexes. You may be able to collect call numbers, microfilm roll numbers and names of specific collections before going to an archive. Don’t just show up at an archive without doing your homework. Email your archive in advance with your particular research question. Give them what you know so they can help do a thorough search when you get there. Question 6 – Have I recorded my research results both positive and negative? Track your research progress. So very important. You would be shocked at how many of us duplicate our efforts because we forget we’ve already checked a particular resource. Again, seems basic but many do not do this and end up retracing their steps with the same results or aren’t able to determine where a particular piece of information originated from. Don’t let that be you. Question 7 – What are my conclusions, or do I have to reassess my theory? Now go ahead and write up your conclusions, do they coordinate with your working theory? Or do you need to reassess and develop a new theory and begin the research process over again? Repeat this method for all your ancestors and their unanswered questions, and you’ll have a very focused and organized process to researching.